A date for the December diary! 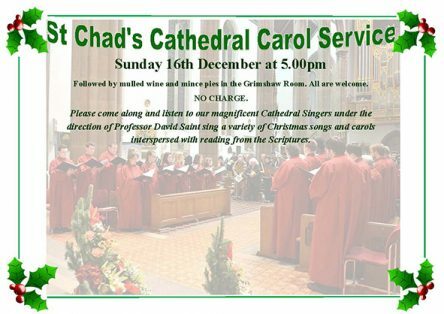 St. Chad’s Cathedral Carol Service – Sunday 16th December 2018 – followed by mulled wine and mince pies in the Grimshaw Room. Please come along and listen to our magnificent Cathedral singers under the direction of Professor David Saint sing a variety of Christmas songs and carols interspersed with readings from the scriptures. All are welcome. NO CHARGE.